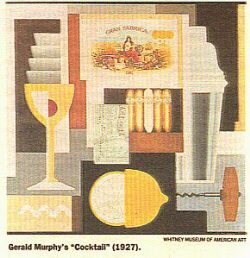 Gerald Murphy (1888-1964) painted "Cocktail" in 1927 in Paris. Murphy, whose father was head of the Mark Cross pen company, went to Paris in 1921 as part of a rich kid world tour. His interest was in gardens. He had never painted anything until he saw a Picasso painting in an art gallery window on the Rue la Boetie. In the next six months he was tutored by a Russian living in Paris. Some say that Murphy is the father of pop/op art. Information supplied by Sandra Emme.